Meg is a very smart well behaved girl. She comes out of some nice Candlewood lines and has a great bird drive, she is a pointing lab, but is also very well mannered and mellow. She does excellent out in the field. Excuse the photos, I snapped them with my phone as my website deleted her last photos, new photos to come!!! Her last litter was 11 pups. She is a yellow factored chocolate. 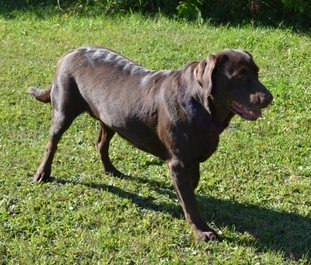 We will be breeding her to Buck in September for a SUPERB litter of chocolates!!! they will have beauty and brains, as well as mega hunting drive!